Students will spend one day preparing western red cedar for weaving and day two weaving. 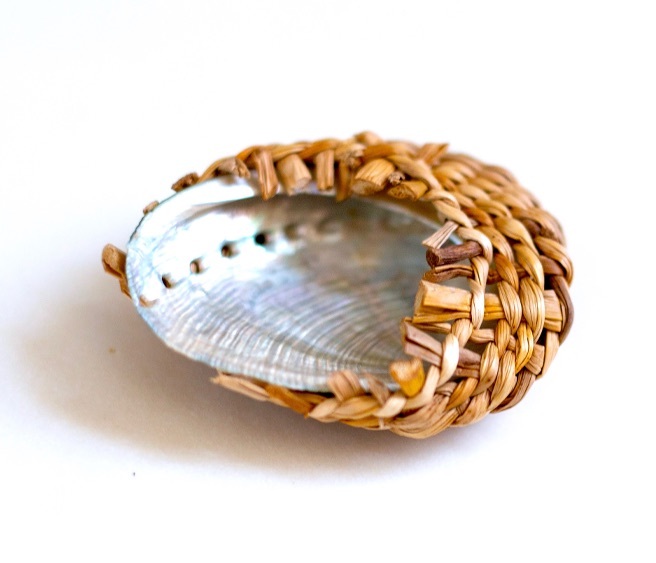 Using local coastal sedge and cedar, students will learn how to weave around a medium-sized abalone shell. Participants will also learn about local Native American culture, plants and their traditional uses for food, medicine or utilitarian items. Stephanie Craig is a 7th generation basket weaver, traditional ethnobotanist and cultural tradition bearer, enrolled in the Grand Ronde Tribe. She is Santiam and Yoncalla Kalapuya, Takelma Rogue River, Cow Creek Umpqua and Clackamas Chinook. She has a Bachelor's degree in Cultural Anthropology with an emphasis in Pacific Northwest Native American Culture and a Master's degree in Cultural Anthropology/Archaeology in Western Oregon Native American Culture, Cultural Museum Studies and Folklore. She also used her tribal language Chinook Wawa as her college foreign language requirement. She comes from a master basket weaving family, including Martha Jane Sands and Hattie Sands Hudson of the Grand Ronde Tribe. She carries on the traditions of her family and her Tribe. Joe Craig is Nez Perce, Umatilla and Cayuse. He spent his entire life on the Reservation, growing up in the Tribal Longhouse practicing the old ways as a dancer, singer, drummer, Longhouse leader, hunter and spiritual leader.